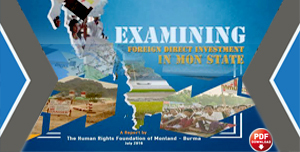 HURFOM’s field researchers gathered accounts of human rights abuses committed in the areas in which ethnic minorities reside during the eight month-long aftermath of the installation of the President Thein Sein-led civilian government. 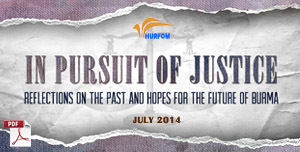 From December 2011 to the 2nd week of January 2012, HURFOM field researchers documented the human rights violations of local residents, of whom the majority are Karen people, from Than-ta-bin Township, Toungoo District, Pegu Division. The documented human rights abuses were committed by the battalions under Military Operations Command No. 9 (MOC). The abuses include forcing locals to serve unpaid labor; commandeering local-owned motorbikes, trucks and oxen carts to transport army supplies; and the use of truck drivers as human shields to drive their trucks through newly-made military routes as a purpose of clearing landmines. 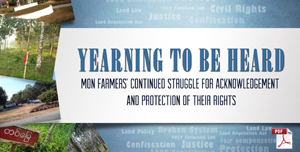 In addition, from December 2011 to February 2012, HURFOM also documented the human rights abuses faced by local residents in Kyainnseikyi Township, Kawkareik District, Karen State. The abuses committed by the government troops include the enforcement of villagers to porter and to serve as human shields; forcing local truck drivers to carry government troops’ supplies; shooting innocent villagers and accusing villagers of having contact with rebel groups. HURFOM has so far found out that human rights abuses are still being committed by government troops in spite of the establishment of a new civilian government and the founding of the National Human Rights Commission. Harvesting durian, mangoes, and betel nuts is what local residents in Htan Ta Bin Township, Toungoo District, Pegu Division depend on for their families’ incomes. The majority of residents are Karen and they have to struggle for their daily meals. However, besides struggling for their daily lives, they face various human rights abuses committed by local based government’s battalions under the authority of Military Operations Command (MOC) No. 9. According to HURFOM’s findings, both male and female villagers from Htan Ta Bin Township are forced to serve as porters, carrying army supplies, while also having to provide a large amount of money for government troops to celebrate the New Year holiday. In addition, the villagers in Three Pagodas Pass Sub-township and Kyainnseikyi Township, Kawkareik District, Karen State depend on the farming of rice, corn, tobacco leaf and other seasonal crops for their livelihood, while some also depend on driving trucks for their income. It is, however, not easy for them to escape the local based government battalions from forcing them to serve as porters and human shields. According to a truck driver from Ye-lae village, Kyainnseikyi Township, many truck drivers in the area are frequently ordered by the government battalions to carry their supplies, while they also have to provide the gas and money for transportation. For them, there is no guarantee of safety during their term of forced labor because of the constant fighting between government troops and the rebel groups in the area. 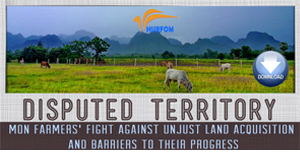 Starting in December 2011 to the 2nd week of January 2012, HURFOM documented the human rights abuses of villagers in Htan Ta Bin Township, Toungoo District, Pegu Division perpetrated by the government’s battalions under the command of Military Operations Command (MOC) No. 9. The abuses include unpaid labor, and the commandeering of their motorbikes, oxen-carts and trucks for the use of transporting military supplies. 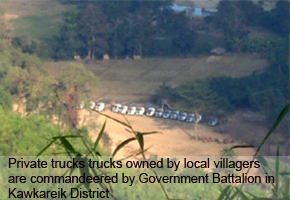 Bawgaligyi and Yethogyi villagers were forced by the troops of Bawgaligyi-based frontline of MOC No. 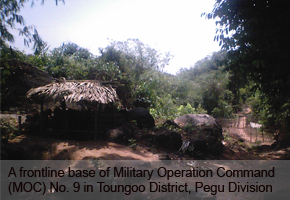 6, in Taungoo Town, Pegu Division, to carry army rations. Each villager had to carry two packages of rice on his or her motorbike from Palae Wa military base to Bawgaligyi base. HURFOM field reporters documented that those 18 villagers who were forced to carry army rations were between the ages of 20–37. The villagers who had their motorbikes and trucks commandeered were forced to un-plant landmines, and were also kept for the use of forced labor. If the amount of money demanded were not paid, the troops would intimidate the villagers by threatening to come to the village and ruin the village’s New Year celebrations. Because of the intimidation tactic the villagers had to pay the demanded amount on 17th December 2011.Saw Baw-par, a villager from Tar-thu Kee village, was also taken by the troops as they accused him of being a member of the KNU. Bawgaligyi based MOC No. 9’s Captain commandeered a truck and five motorbikes, besides taking a driver of a digging truck from Bawgaligyi village, on 5 December 2011. The 6 drivers had to drive from Bawgaligyi village to Maung Daing Gyi carrying military supplies as ordered by the MOC No. 9’s Captain. On December 9, 2011 32 local residents from Ye-ta-kon village were forced by LIB No. 375 based in Ye-ta-kon village, Htan Ta Bin Township to cut and clean the bush on the way from Ye-ta-kon village to Pa-lae-Wa village. 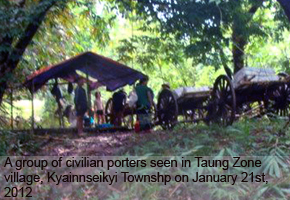 On 7 December 2011 48 male villagers and two female villagers from Ye-ta-kon village were forced by LIB No. 375 to cut and clean the bush on the way from Ye-ta-kon military base to Pa-lae-wa village. On 7 December 2011 from 18:40 pm to 20:00 pm there were about 10 mortar shells fired from outside the village by troops from MOC No.9’s LIB No. 378 led by Battalion Commander Lin Thein Oo from Maung Ngaw-gyi Frontline base including gun firing in to the village. Of 10 mortar shells fired five shells went off in the village while the other five shells exploded outside the village; no villagers were injured. On December 13, 2011, 16 villagers, made up of 13 males and three females from Maung Ngaw-gyi village, were forced by LIB No. 378’s battalion commander Lin Htein Oo to porter their rations from Maung Ngaw-gyi village to Nan-Changkwin village. On December 15, 2011, again, there were 13 male villagers and three female villagers from Maung Ngaw-gyi village forced to carry army rations from Maung Ngaw-gyi to Nan-change-kwin village. 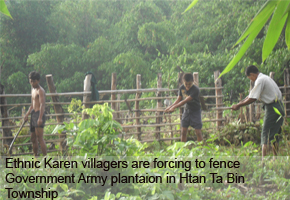 On 14 December 2011 seven villagers from Ye-ta-kon village were forced by LIB No.375 to clear out the road from Ye-ta-kon village to Pa-lae-wa village, Htan Ta Bin Township. On December 18, 2011 LIB No. 357’s Column No. 1 and Column No. 2, made up of over 100 fighters, came to the station in Sat-ka-wat village. The two columns headed back to Taung-palon village on December 20, 2011. On their way back, they took about 24 Sat-ka-wat villagers, consisting of males and females, to lead the troops to Taung-palon village as human shields. Some of those villagers were middle-aged adults while some were as old as 60-67 years old. In addition, on December 29, 2011 MOC No. 9’s LIB No. 375, based in Tap-bu village, ordered the drivers of 16 Ox-carts from the village located at the bottom of mountain to carry their army supplies to Htee-Muu-tar base. On 14 December 2011 IB No. 62’s Column No.2, led by Major Ko Ko Oo, arrested two residents from Ah-nan Kawin village, Three Pagodas Pass (TPP) Sub-township, while two other villagers from the village were arrested by the same Column again the next day, December 15 2011. The arrested villagers were forced to guide the way for the troops and made to carry the army’s food supplies and other materials. On December 16 2011, the first two villagers escaped from the forced labor, whereas the other two arrested villagers were freed to go home on the same day. HURFOM documented that with the reasons of ongoing fighting in the region, the government troops continue to commit human rights abuses to ethnic groups living in Kyainnseikyi Township, Kawkareik District, Karen State. During their military operation, the government troops from LIB No.562 shot a local resident. The resident was being interrogated by the troops on KNU movements, which the resident could not answer properly due to language difficulty. This event shows that the ordinary villagers who have to struggle for their daily meals and who have no knowledge of ethnic armed group’s movement are still facing inhumane torture committed by government troops. The shooting of the innocent villager took place near Ta-po Poe-hta village, which is located west of Hongta-raw stream, lying west of Kyaik-don — Kyainnseikyi highway, in Kawkareik District, Karen State. Ta-po Poe-hta village has only 25 households and the majority of the villagers depend on farming for their living. The villagers depend on roughly a two mile long farmland close to the village to grow rice, corn, tobacco leaf and other seasonal crops for their livelihoods. The government troops’ suspicion and treatment of the Ta-po Poe-hta villagers as informants of the KNU place the villagers in a dangerous situation in which they are always questioned by authority. The latest case occurred during the military operations. When the villagers could not answer the troops’ interrogations, they were beaten up, killed, and had their belongings taken away. 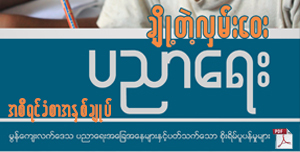 An interview with Saw Ka-lon Sae (not the interviewee’s real name), the witness stated that on 30 January 2012, Saw Khaing Kyi (not the victim’s real name), 35, a Ta-po Poe-hta villager, was questioned by a Column from LIB No. 562, led by Second Colonel Kyaw Naing, when he was heading back from his crop field and before getting to his village about 5 Furlongs. Saw Khaing Kyi’s right thigh was shot. “Saw Khaing Kyi is from my village. He can only speak Karen. We, the villagers, know that he is quiet and innocent. 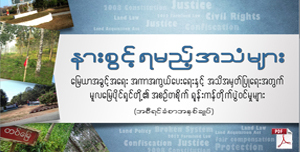 He can not tell anything about armed-related issues in Burmese. The Colonel Kyaw Naing is the worst Colonel in the region. Saw Khaing Kyi was taken to the troops’ base when he was heading back from his crop field. He was questioned there, and then his jaw was hit. As he could not reply in Burmese, he was verbally abused and finally got shot in his right thigh by the troops. We saw the occurrence and we thought he was dead. We took him to the village after he stopped bleeding. Because the bone in his leg got hit by the bullet, we are not sure that his leg will recover and if he can even use his leg like before. He has three children and the whole family depends on him.” Witness, Saw Ka-lon Sae. When HURFOM contacted a member of the Township Administration in Kyainnseikyi Township, Kawkareik District, he said that that the case was true, but the troops did not ask any questions concerning with the KNU but Saw Khaing Kyi just got shot as he could not reply to what they asked. The official could not give any more details. “It is sure that change and reached peace agreements talks have only taken place in Rangoon, Nay Pyi Taw, and other big towns. But for the local villagers residing in the countryside (or in rural areas), they just continue to face abuses that affect their livelihoods. We hear about that. The real reform will not happen if human rights abuses continue to be committed in the rural areas. The army troops should obey their government’s order and respect human rights. I just want to say that ongoing abuses and oppression should be stopped right now.”, Officer from the KNU’s Kyainnseikyi Township Administration. On 13 February 2012 at 8 AM, LIB No. 283’s Lieutenant Colonel Moe Myint Kyaw, together with his 35 men, demanded five truck drivers, who were driving to Kyainnseikyi, to carry the army’s rations and other materials. The drivers themselves had to load on the stuff and they were forced to drive ahead of the frontline troops. Also, the drivers had to give some gallons of their gas and money to the troops. The statement below was given by a driver, a native of Ye-lae village, Kyainnseikyi Township. His name is Pan-ko, 30, a Lon-shan native. “In this year alone, the truck I d rive has been commandeered about 12 times already. I had to provide labor, gas, and even money. I do not own the truck, I’m just hired to work as a driver according to the seasons. It really affects us as they just use their power, pointing their guns at us and forcing us to work. On 13 February at 8 AM, we had to drive to Pin-ma Kon 283 army base in Three Pagoda Pass Town to load on their stuff and then drive out on the same day. They did not feed us anything. Not only did we have to drive their rations on the trucks, we, the people, were also used. We had to load their rations and other stuff on the trucks by ourselves. And, they did not let us go home after using us for one day. Whenever they demanded us we had to work, they only let us go home after three days to one week. And, this last time, they let us go earlier they used us for only two days. Yet, 1,0000 kyat of mine was taken by a soldier. Some other drivers were slapped on the face and yelled at by the soldiers when they asked to let them go home. And, we could not drive as we wished. It was just like we were driving held by gunpoint, the enemies could shoot anytime they wanted. I was just tired, I kept praying that no fighting would breakout while I was driving for them. If I was unlucky, the truck would be damaged and I would be dead.. Last year, a friend of mine was driving to Ye-lae and Taung Sone villages as demanded by the government troops. He was shot dead since fighting broke out while he driving. I had to pray for it not to happen to; it was very dangerous. We knew that we would be forced by the troops as long as they were here. It was too unfair to force us like this. We just wanted them to understand our situation and how we had to struggle for our daily meals.”,Pan-Ko. 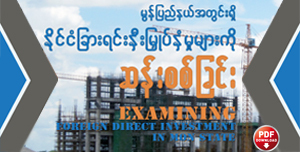 It is clear that although many people believe that President Thein Sein and his Administration have taken some steps of change, for those villagers in Htan Ta Bin and Kyainnseikyi townships the “change” is just a word as they are still experiencing human rights abuses at the hands of government troops, such as those documented in this report. The findings in this report show that civilians residing in the affected areas have become the victims of extortion and inhumane torture by government troops. In addition, they are forced to carry military supplies, to clean and cut the brush, and to clear landmines by walking ahead of the troops, besides providing their oxen-carts, motorbikes, and trucks for the use of carrying military supplies. Finally, they were demanded to provide a large amount of money for the government battalions’ New Year celebrations. Despite the establishment of a supposedly civilian-led government and the formation of the National Human Rights Commission, human rights abuses are still prevalent throughout the rural areas. Hence, it is a moral imperative for the new civilian government to move towards expansive democratic reforms, which contributes to all ethnic groups. And to establish political dialogues with all ethnic armed groups in order to end fighting and to bring about a stable peace. If the government continues to ignore the human rights situation throughout Burma, the people of Burma will continue to face and suffer human rights abuses in an environment of impunity.